The nutrition information on this tab is specific to a portion size. 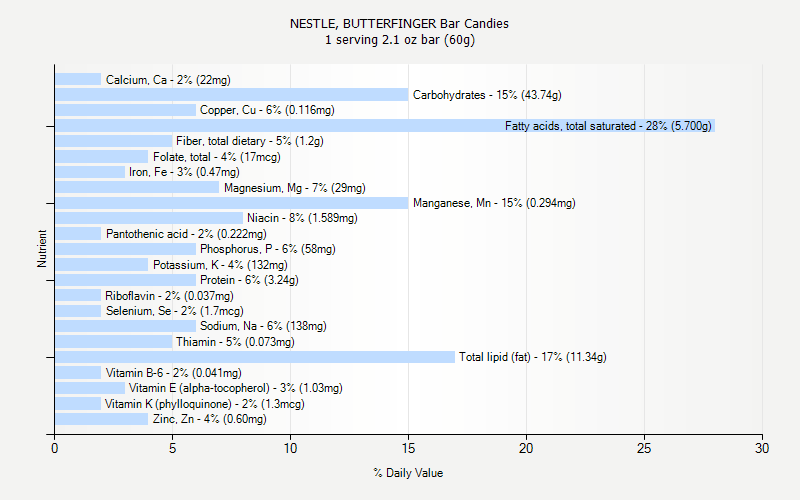 This tab shows nutrition for 1 serving 2.1 oz bar (60g). The Nutrition Facts box is a quick and familiar way to get information for common nutrition values. 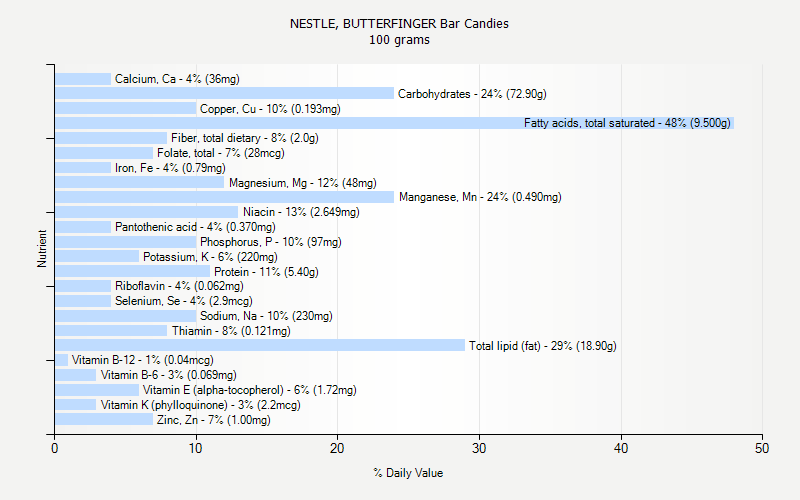 Below is a chart with a more complete listing of nutrients and the daily value percentage for each. 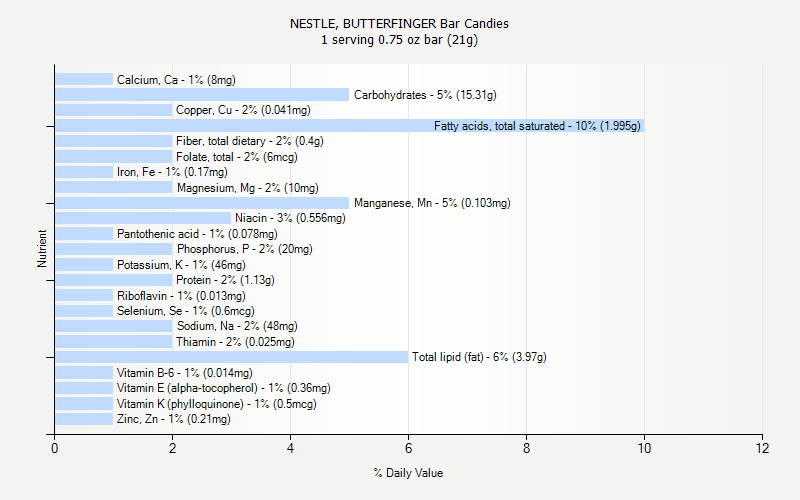 Complete nutrition information is listed at the bottom of the page. All information is sourced from the U.S. Food and Drug Administration. The nutrition information on this tab is specific to a portion size. 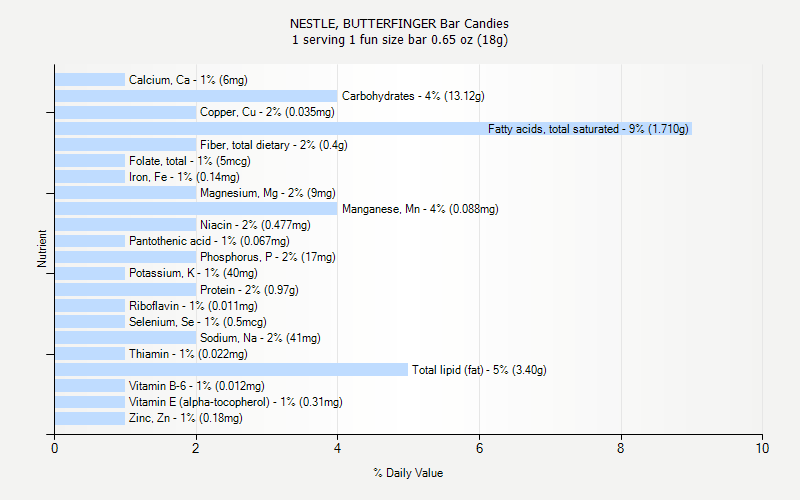 This tab shows nutrition for 1 serving 1 fun size bar 0.65 oz (18g). The nutrition information on this tab is specific to a portion size. 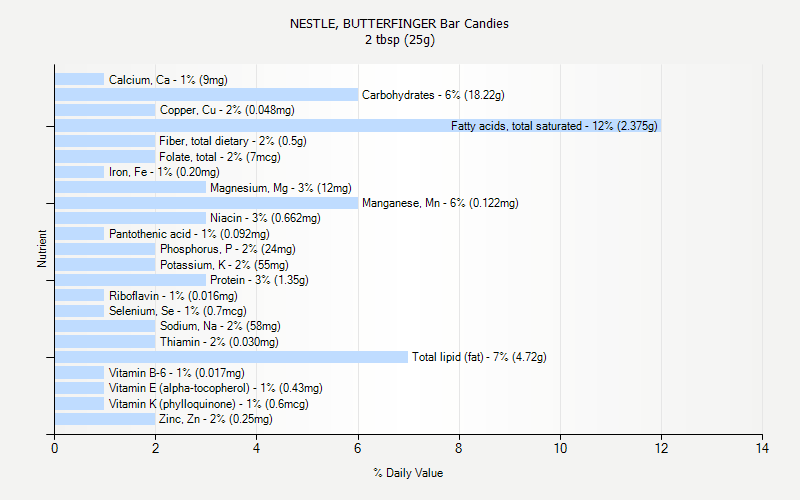 This tab shows nutrition for 1 serving 0.75 oz bar (21g). The nutrition information on this tab is specific to a portion size. 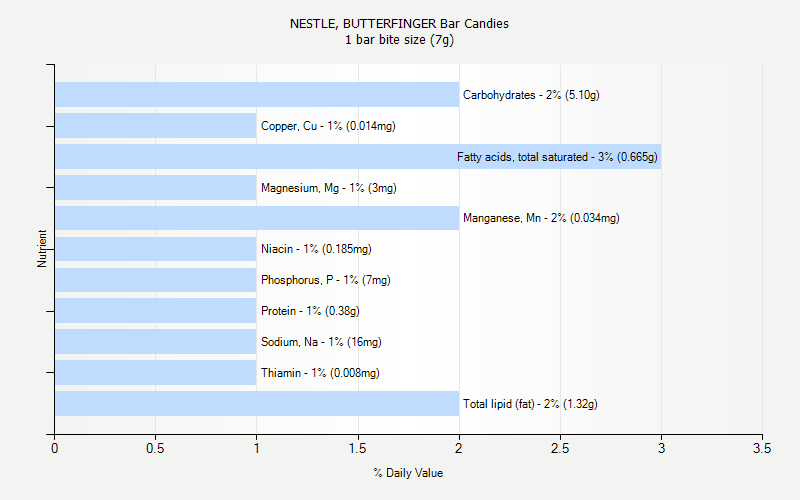 This tab shows nutrition for 1 bar bite size (7g). The nutrition information on this tab is specific to a portion size. 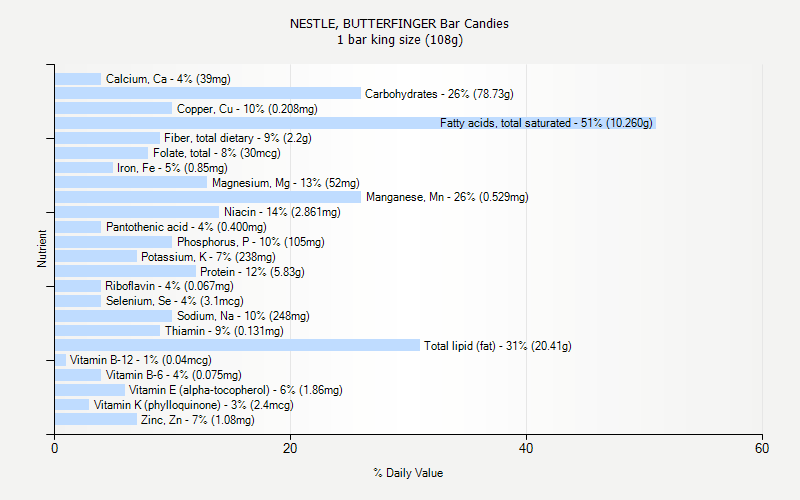 This tab shows nutrition for 1 bar king size (108g). The nutrition information on this tab is specific to a portion size. 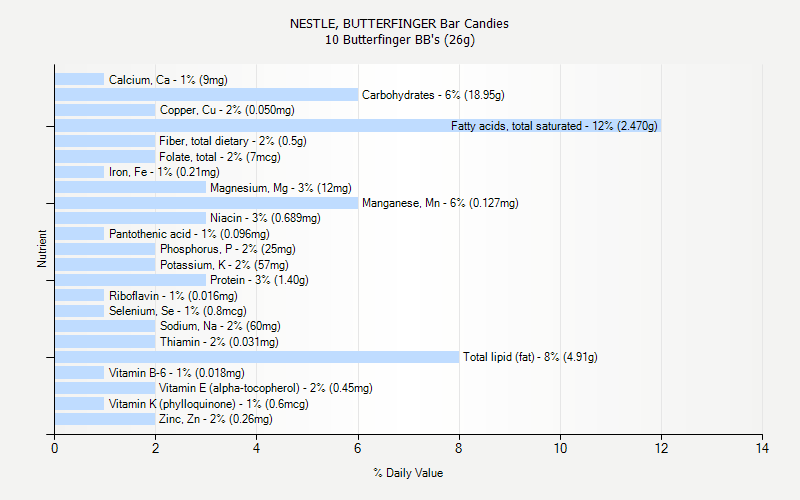 This tab shows nutrition for 10 Butterfinger BB's (26g). The nutrition information on this tab is specific to a portion size. This tab shows nutrition for 2 tbsp (25g). The nutrition information on this tab is specific to a portion size. 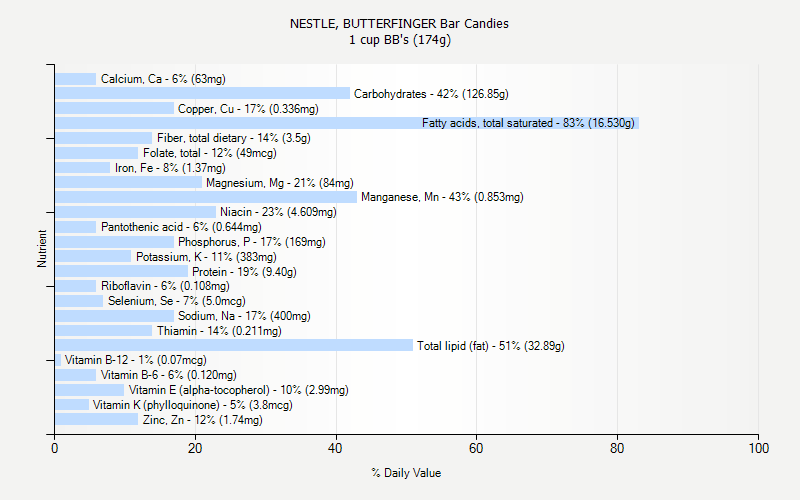 This tab shows nutrition for 1 cup BB's (174g). The nutrition information on this tab is specific to a portion size. This tab shows nutrition for 100 grams .